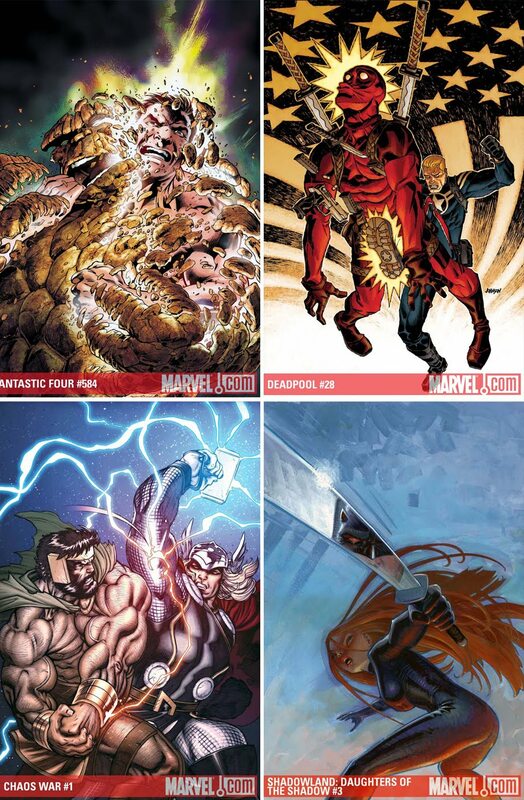 Now Comic Con has moved on, Marvel's October solicits are in. These four covers some of the strongest there is. Gotta love that kick that Steve Rogers is delivering. My hero! I just don't get Deadpool, and feel the same way Rogers must be feeling there. Fessing up time, I almost posted that cover up alone Doug, it says so much. I 'get' Deadpool (especially written by Joe Kelly), but I don't get the extent of Deadpool. Must be because I'm too stuck in my ways to see the icons of Marvel as anyone other than Hulk, Cap and Spidey. Still Cap kicking yahoo's in the yahoos is pretty bad @$$ at the best of times, let alone drawn by Dave Johnson! That man has more talent than one person should be legally allowed. "Yahoos in the yahoos"! My goodness, I'm feeling exceptionally middle-school minded today. Must be a lack of sleep, but that's funny.